Did Benjamin Maddox die in 1811? In our lengthy assessment of at least five Benjamin Maddoxes living in the Abbeville County and Laurens County areas of South Carolina in circa 1800, we wrote that an 1811 Laurens County deed described Benjamin Maddox — the son of Benjamin Maddox (I) of Maryland — as “dec’d” (deceased). This assessment was based on a transcription obtained from the Laurens County Court many years ago. A close look at the 1811 deed, including the word long believed to be “dec’d”. After reading our assessment, fellow family researcher Samantha Nifong kindly retrieved the original deed, which does appear to include the word “dec’d” (deceased) after Benjamin’s name… or is it the word “viz” (legalese for “that is”)? If anyone can provide an accurate transcription of these few letters, we’d appreciate it. The description of Benjamin as “dec’d” in 1811 has important implications for the Maddox lineage in South Carolina, Kentucky, Illinois, Alabama and Georgia. For example, if he died in 1811, he cannot be identifiable with the Benjamin Maddox who died in Atlanta, Georgia, in 1864. But if he went on to live after 1811, it potentially contradicts our long-held assessment of Benjamin Maddox (II). Hopefully this won’t become a #thedress phenomenon. In 1684-1685, our 8th-great grandfather Cornelius Maddox sued our 9th-great grandfather Edward Maddox for one thousand pounds of tobacco in a series of court appearances in Charles County, Maryland (Charles Co., Md. Circuit Court, Liber L, pp. 15; 69; 106-7). Cornelius is described as a merchant and Edward is described as “chyrurgion” (surgeon) and doctor. We’ve obtained a full copy of the two-page court document, which we had hoped would provide more evidence that Cornelius was the son of Edward. Instead, we’re having trouble deciphering a few letters of Colonial-era script that might offer clues to the duo’s identities. The above excerpt from the second paragraph of the 2-page court record clearly says, “Maddock Merchant of…” what? The next word seems to begin with the letters a and p, but then becomes a hot mess. Is it “apples”? Is it “a plea”? Is it shorthand for something entirely different? We’ve established that our 9th great grandfather lived in southern Shropshire, England, before emigrating to Maryland in the mid-1600s. As we begin to dig into local Shropshire records in search of more data and stories, it’s useful to place the family in the historical and etymological context of Shropshire and their presumed earlier home of Wales. Madog/Madoc is the original spelling of our name, as used in Wales as a forename by ethnically/culturally Welsh ancestors at least as long ago as the 6th century. Saint Madoc established a monastery in the 6th century at the eponymous Llanmadoc, on the Gower Peninsula, but that doesn’t mean he was the first Madog/Madoc in the area and it doesn’t give us a clue to the earlier origins of the name. One writer has made a speculative claim that Saint Madoc’s DNA is similar to DNA found among the Gaulish Medulli people, including a Medulli group that lived in Medoc, France. The Madog/Madoc lines in Wales are famous for their short-lived kingdoms and their rebellions against Norman and English invaders. Kings bearing the Madog name had a part in the establishment of the Powys kingdom after the Romans left Wales in the 5th century, and kept the Powys kingdom going for centuries. Our known 17th-century ancestors might have descended from Powys’s Mathrafal dynasty, which included the 12th-century founders of the Powys Fadog kingdom (Fadog means Madog) and the Powys Wenwynwyn kingdom some decades later. These kingdoms once held the majority of Wales and parts of Shropshire. The Powys Fadog kingdom was politically centered on Dinas Bran and spiritually centered on Valle Crucis. The Powys Wenwynwyn kingdom included Munslow, Shropshire, where our Edward Maddox lived in the 17th century. Perhaps the Powys Wenwynwyns deposited Edward’s grandfathers there. Castle Powis in Welshpool, Wales, was originally owned by the Powys Wenwynwyn line. It is now the property of the Earl of Powys. The castle is open to the public and includes art and objects stretching into the 15th century. We took the above courtyard photo during a tour in 2017. The Powys Fadog kingdom fought with the Gwynedd kingdom to the north, which included numerous prominent Madog/Madoc relations. The Gwynedd kingdom would defeat the Powys Fadog kingdom in the 12th century. The most famous Madog/Madoc to come from the Gwynedd line was Madoc ab Owain Gwynned, who legendarily sailed to the American continent in the 1100s, and whose descendants would purportedly be found living among Native Americans in the 1600s and speaking Welsh. When American Maddox researchers claim ancestry in Wales via 17th-century Maryland and Virginia colonists, it’s usually a claim to the Maddoxes of the Powys Wenwynwyn kingdom, whether the researchers know it or not. This claim was propagated by Fredonia Maddox Webster in the first four pages of her 1957 book, The Maddox Family of Maryland. She relayed a romantic British description of the Madogs of Llanfrynach (a few miles southeast of Brecon), whose ancestors rebelled against the Crown before being reduced to minor local nobles. Webster’s four-page genealogy of the Madogs of Llanfynach begins with King Arthur and ends with John Maddox, progenitor of Maryland colonist Samuel Maddox. Many hopeful family historians have claimed that their Maddox line includes a Thomas Maddox, who settled near Jamestown, Virginia, in 1620 and died by 1623 (possibly due to injuries after the Indian Massacre of 1622). They claim that this Thomas is identifiable with “Thomas Lord Scethrog,” and again they refer to Webster’s book, even though Webster writes that Thomas died in 1620. Webster claims that Thomas Lord Scethrog was the father of John Madog, who was the father of Maryland colonist Samuel Maddox. One researcher has found a 1607 gravestone for a “Gwladis, married Thomas Maddock, Lord of Scethrock” in Saint Meugan’s Church in Llansantfraed, providing perfect evidence for a geographic location… if only the genealogical link to the Maddox colonists could be proven. But so far it has been impossible to actually document known Colonial ancestors into the royal Madog/Madoc lineage in Llanfrynach. While hopeful Maddox family historians may claim links to Fredonia Webster Maddox’s 16th-century Madogs of Llanfrynach, our own Maddox ancestors were living 60 miles to the northeast in Munslow, Shropshire, at that time. Our Maddoxes were geographically closer to the extraordinarily beautiful Powis Castle, where the last of the Powys Wenwynwyn heirs lived in the late 13th century. But the illegitimate son of the last Powys Wenwynwyn prince sold the castle to the Herbert family soon thereafter. The Madogs of Powys Wenwynwyn were dispersed throughout the modern area of Powys. The kingdom of Powys Wenwynwyn included western Shropshire, where Edward Maddox lived in the mid-1600s. Credit: Wikipedia. The name Madog did not originally serve as a static surname. It was a forename. Parents could name their sons Madog for many reasons, and the use of the name didn’t necessarily mean a blood relationship to any of the Madogs that came before. For this reason, not every Madog in Wales should be considered a relative. One researcher provides a deeper explanation here and another expresses frustration here. For over a millennium, the ethnically/culturally Welsh used the Madog forename as a patronymic, meaning that a man would identify himself with his father’s name (or rarely his mother’s name). For example, Madog ap Dafydd meant Madog son of Dafydd. A woman would use matronymics, placing the term ferch (daughter of) before her mother’s name. This was intended to establish genealogy for legal proceedings, but records and genealogies among the ancient Maddoxes are few and questionable. While Welsh ancestors called themselves Madog/Madoc, ethnically/culturally English ancestors just to the east simultaneously spelled their name Madocke/Maddocke, based on a study of thousands of 16th-century records. The use of patronymics generally ended in 1536, when Henry VIII passed the Act of Union, which put an end to the tradition in favor of Anglicized surnames. Some families then incorporated the ap at the front of their surnames. For example, the Rice surname became Price. Other families added a possessive s to the end of their surname. For example, Jone became Jones. In England, Madog/Maddock became Maddocks/Maddox. But the Welsh continued to use Madog/Madoc. The transition to Anglicized surnames in the mid-16th century can help us establish geography and distinguish between families. Our known ancestor Edward Maddox and his children used English spellings as early as the 1640s in Munslow Parish baptismal, marriage and burial records, implying English cultural/ethnic identity. This could also imply an eastward aspect: they probably had been doing business with the English, whose centers of commerce were to the east toward London. Among the intriguing records we’ve already found in the Shropshire Archives is the 1630/1 will of John Everall of Wentnor, Shropshire, referring to his son Edward Maddox and his grandson Edward Maddox. The dates match our Edward Maddox’s chronology, location, and son’s name in Shropshire. But why a man with the surname Everall would have a son and grandson with the surname Maddox is… confusing. But if we reverse-engineer Everall’s name into his original patronymic (for example, the name Evans was originally ap Ieuan), we see that he might have been called ap Iarll before surnames were fixed. Ap Iarll translates to “son of Earl.” Perhaps – just speculation – he was derived from the Powys Wenwynwyn royal line, and had a complex series of wives and children, as many of the royals did. Or maybe the story is much more basic. Lots more work to do. The 16th-century Guild in Shrewsbury. A ribbon of metal inlaid in the stone below the Guild explains that the Welsh and English cooperated in the Guild. It turns out that the town of Shrewsbury, in Edward’s County of Shropshire, was the center of trade (export) for woolens and the headquarters of the Drapers Guild. Edward lived just south of Shrewsbury in the town of Munslow, placing him ideally for involvement in the cloth trade. Perhaps he was warehousing locally grown wool. Other towns in the area were used as markets or warehouses. The Drapers Guild fell apart in the mid-1600s after the Glorious Revolution. According to a Wikipedia article, “after the English Civil War (1642–51) regulations were made in 1654 ‘for preventing the Drapers forestalling or engrossing the Welsh flannels, cloths, etc.’ Many of the drapers supported Parliament during the civil war, and as a consequence the Company was not given royal support after the monarchy was restored in 1660 under Charles II (r. 1660–85). The cloth trade went into a gradual decline after this date. The number of drapers had fallen back to 61 in 1665.” (Source: The Shrewsbury Drapers and the Welsh Wool Trade in the XVI and XVII Centuries, T.C. Mendenhall) Edward migrated to Virginia at about this time. The cloth trade suggestion is particularly compelling as an explanation for Edward’s migration because he imported “fuetiane” (a kind of heavy cloth) to Maryland in 1675 . It was enough cloth to be reported in official Colonial records (Source: Colonial Survey Report #3964, p. 16). His son Cornelius would be called a merchant in some records and this might have been because of a cloth import business. We’ll have to continue pulling this thread. The Shrewsbury archive contains records of the Guild. Did Edward have a brother in Virginia? Rice Maddox and Samuel Maddox witnessed a 200-acre land purchase by Robert Coleman from Francis Carpenter, 22 Aug. 1659, recorded in Westmoreland County, Virginia. Rice and Samuel could have been brothers or otherwise related. It’s tempting to identify this Samuel with the Samuel Maddox (1638-1684) who lived in St. Mary’s, Maryland, around the same time; however, Samuel Maddox (1638-1684) reportedly immigrated to Maryland in approximately 1665. Four accounts of Dr. Edward Maddox’s 1694 will offer little hope of making a father-son link between the doctor and Cornelius Maddox, our 8th great grandfather, but reveal an unexpected possible link to George Washington’s boyhood home. Dr. Edward Maddox’s original will burned with other Stafford County, Virginia, court records in the Civil War, but the four secondary will records below imply that Cornelius was not included for land inheritance. If Cornelius was a son, he would have had precedence of inheritance over Edward’s daughters Alice and Amey/Anne and over the local parish (see accounts 3&4), but he received nothing in these documents. On the other hand, the doctor owned thousands of acres at various sites in Maryland and Virginia along the Potomac River and these four documents do not necessarily cover all of them. The first three deeds, below, combine to form a 550-acre allotment along the Rappahanock River one mile below the falls, in Stafford County, Virginia. This would later be the site of George Washington’s boyhood home, Ferry Farm. The fourth account is for a 500-acre allotment along the Passapantanzy Creek in Stafford County. “3-263: John Hamilton died seized of 150 A. in Richmond Co. part of 550 A. purchased by Edward Maddock purchased of John Waugh Clk. of Stafford County. Said 550 A. is part of 2000 A. granted Col. John Catlett 2 June 1666 & by conveyances vested in Maddock, who by will 13 June 1694, gave 150 A. of remaining 550 A. not disposed of by his Will to Clark. Endorsement by Marmaduke Beckwith, Clk. of said Co. Escheat grant to Maurice Clark of Richmond Co. 150 A. on Rappahanock R. adj. Mr. Brent & John Robins in Richmond Co. 14 Sept. 1710.” – From “Virginia Northern Neck Land Grants,” Book No. 3, 1703-1710, Baltimore: Genealogical Publishing Company, Inc., 1987, p. 44. “Indenture ffirst day of March 1721/ffryday 2nd March 1721 between THOMAS STONE of Charles County in the Province of Maryland Gent. and WILLIAM THORNTON of King George in Colony of Virginia .. by Deeds of Lease and Release .. for thirty pounds Sterling .. grant 200 acres about a mile below the ffalls of Rappahanock river it being part of a tract containing 2000 acres granted to Colo. JOHN CATTLETT by pattent bearing date 2 June 1666, 500 acres of which by sundry means conveyance passed in the proper court became property of one EDWARD MADDOCK late of Stafford County Deceased who by his last will in writeing bearing date 23rd June 1694 and duly proved in Stafford County Court December the 11th 1694 relation thereunto being had .. did give 200 acres of land above said of the said ffive hundred acres to one JOHN ROBBINS son of ROBERT ROBBINS in Maryland and his heir .. with this reservation and proviso that if JOHN ROBBINS should dye without issue of his body lawfully begotten said land should descent to JOHN STONE Son of JOHN STONE Elder of Maryland and his heirs forever which said parties being dead without heirs of their body .. the same doth descend to the within named THOMAS STONE only Brother of the said JOHN STONE of the whole blood as heir at law.” – From 1721-1735 King George County Deed Book 1, Part 1, (Antient Press); pp.54- 58. 3. The third account of Dr. Edward Maddox’s will also relates to the first and second accounts, above. In this 1723 King George County, Virgnia, deed, Alice Cale (probably the doctor’s daughter) receives 200 acres of the 500-acre plot that was originally owned by Dr. Edward Meaddock. This third account of 200 acres completes the dispersal of Edward’s 550-acre plot along the Rappahanock River. Cale’s acreage is specifically described in the National Park Service’s survey of George Washington’s Ferry Farm site. 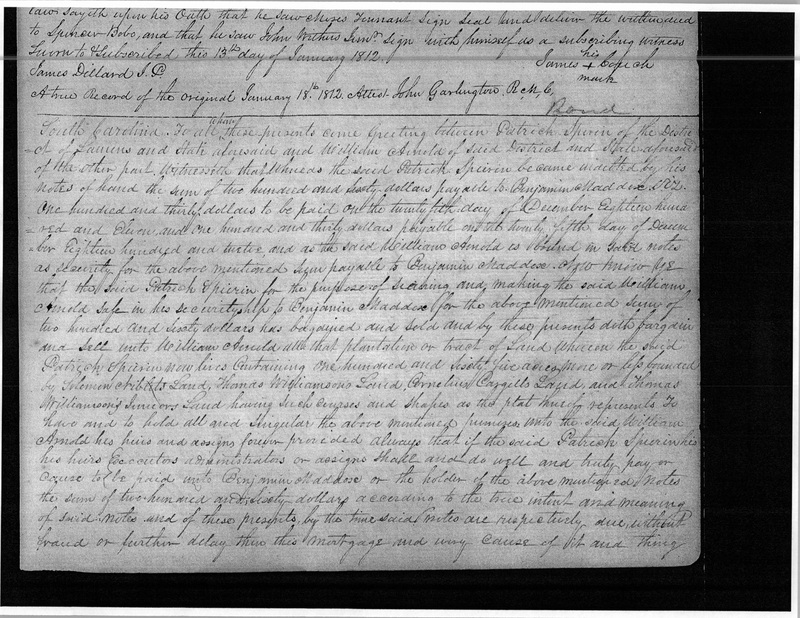 “Indenture 3rd/4th March 1723 between CHARLES CALE and ALICE his wife of Parish of Hanover King George County and WILLIAM THORNTON of same by deeds of Lease and Release .. sold 35 acres for ffourteen pounds current money tract being on North side of Rappahanock River in King George about a mile below the ffalls of the said river .. it being part of a tract of 2000 acres granted to COLL: JOHN CATLET by Pattent bearing date 2d day of June 1666 ffive hundred acres of which having been passed by sundry conveyances at length became the right of EDWARD MEADDOCK late of Stafford County deceased who by his last Will in writing bearing date 23rd day of June 1694 and duly proved in Stafford County Court December 11th 1694 relation being thereunto had .. did grant unto the within named ALICE now the wife of the said CHARLES CALE 200 acres part of the said 500 acres of which 200 acres are hereby leased and is a part and includes the plantation whereon the said Charles did lately live .. bounded .. East side of mouth of Claburns run; land now in possession of WILLIAM THORNTON which he bought of Mr. THOMAS STONE; on run a little above Fitzhugh’s Mill pond ..
ALICE being soley and secretly examined .. acknowledged her Right of the Land .. to be to the uses in the said Deed ..
7th August 1724 .. Deeds of Lease and Release recorded.” – From: 1721-1735 King George County Deed Book 1, Part 1, (Antient Press); pp. 249-252. “Doctor Maddox’s plantation consisted of between 450 and 500 acres on Passapantanzy Creek not far from the plantation of the Reverend Mr. John Waugh. It was enjoyed as a glebe by the curate of Stafford [later Overwharton] Parish until after the death of the Reverend Mr. Robert Buchan in 1804 when Doctor Maddox’s descendants instigated suit claiming it was no longer being used as stipulated in his last will and Testament and recovered it.” – From Boogher, William Fletcher. Virginia, Overwharton Parish Register, 1720 to 1760, old Stafford County. Washington: Saxton Printing Co., 1899, pp. 176-195, online at http://www.rootsweb.ancestry.com/~vastaffo/overwhartonparishregister176.htm. The book Abstracts of the Testamentary Proceedings of the Prerogative Court of Maryland, Volume X: 1704-1707, Liber 19C:35 (page 75), lists a “bond of James Maddox administrator of Cornelius Maddox (pauper),” dated 7 March 1705/6, and explains that “Mary Maddox the widow renounced administration, in favor of the eldest son James Maddox,” dated 25 February 1705/6. Benjamin Adams secured the bond. The title “pauper” is jarring, given Cornelius’ success in planting, his known property, his marriage into a well-to-do family, the support system that his large family could offer, and his sons’ primogeniture-based land ownership. But it’s very likely that this refers to our Cornelius. Our Cornelius did die around the time that this bond is recorded (Cornelius’ estate was inventoried on 9 March 1705/6), his first son was named James, and Cornelius’ widow’s name was Mary (Smallwood) Maddox. Reviewing Cornelius’ March 1706 inventory, the list of property would not place him in the pauper category. Beyond the necessities – tables, chairs, featherbeds, soap, buckets and more – that would support a small household, there were luxuries, including a silk petticoat, 5 books, wigs, pewter plates and utensils, and more. His estate was sold off at a profit for the family. It’s likely that the term pauper was applied in a court document simply to flag what were probably disproportionate debts, since he died mid-career and unexpectedly. It turns out Abe Lincoln really did do some wrestling in those Illinois towns. A 1995 Sports Illustrated story probably is the best recounting. Edward Maddox, Cornelius’ presumptive father, is noted in a Colonial Survey Report (#3964, p. 16) in the Virginia State Archives, for importing “fuetiane” on 14 March 1675. “Fuetiane” is a misspelling of “fustian,” which is a heavy woollen cloth used by the colonists for clothing (sort of like jean cloth). Cornelius can be found in later Maryland records, importing similar cloth. It’s possible that Cornelius was simply continuing his father’s business. Just worth noting along the way to proving their father-son relationship. Try as we might, we cannot find any evidence of Lolith Irene Maddox‘s graduation or participation at the Illinois Normal School (now called Illinois State University) in Normal, Illinois. Later in her life, she told her family that she attended college there – where she learned typing and other administrative skills that she would put to use at the Purina company. In the 1940 census in Chicago, Irene claimed to have received two years of college education. Based on her 1923 graduation from Palestine High School, she might have attended Illinois Normal School between 1923 and 1938 (in 1938 she was in Chicago). The Illinois State University Archives Administrator sent us a letter informing us that they were unable to locate any records of her attendance. Our own searches of the ISU yearbook archive turned up zilch. This adds to Irene’s intrigue… and our confusion. A previous search of the (extremely overpriced) Vogue Magazine archives failed to unearth any of the articles that she wrote for the magazine, despite her consistent stories of having written numerous articles for them. As we’ve documented on her page, Lolith Irene used innumerable names – mostly nicknames, but also some false names – that are infuriatingly misleading in our searches for documentation of her moves and life events. Perhaps we’ll get there someday.